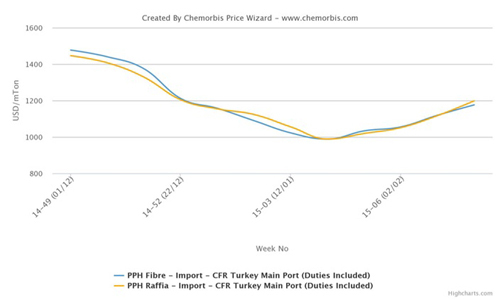 Having hit the bottom at the end of January following a downturn that had been in place since August, Turkey’s polyolefin markets have been moving up steadily since then, according to ChemOrbis. Even though some players expected the upturn to be slow given the fact that buyers met their immediate requirements in the early days of February, availability concerns supported sellers in their quest for higher prices. In the PP market, ChemOrbis Price Index shows that homo PP offers recorded increases of up to $150-200/ton on average in the past four weeks, cancelling the losses recorded throughout December 2014. Buyers initially felt that the increases recorded in the later days of January would not be sustainable considering that they already secured their needs and their end business is not doing well due to the season. However, the withdrawal of nearby suppliers, including Egypt and Europe, the absence of Middle Eastern suppliers and cancelled orders, particularly from Iran, continue to stir concerns about tight supplies across the PP market. Thereby, further price increases are well supported in this environment, even though some players believe that sellers are holding onto their stocks on purpose. A similar picture is in place in the PE market, although the upturn does not appear to be as sharp as it is in the PP market for now. The upward trend of PE started later than for PP and the momentum of the increases has been relatively slower in the past three weeks. 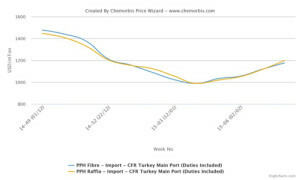 This week, buyers in Turkey reported receiving an LDPE offer from the Middle East for March shipment with $70-80/ton increases while Iranian LLDPE showed up with increases of up to $150/ton when compared to three weeks ago. Limited prompt availability is a problem for PE as well in Turkey. Distributors holding prompt stocks are offering their cargoes with a large premium while most prefer to hold onto their stocks. Even though some players feel that these price increases are too rapid and have resulted in inflated prices, supply constraints along with firm costs are likely to drive PE prices higher in the near term, according to ChemOrbis. “Middle Eastern suppliers are not actively offering. Iran, from where cargoes are already delayed, is also set to have its Newroz holiday in March. Therefore, supply concerns are likely to dominate the market until the end of March,” said a few players.